Home/Prom Flowers/What Type Of Prom Flowers Are A Great Addition To Your Prom Outfit? Prom is placed in the same category as a wedding because of all of the pomp that goes into the preparation. Prom night is one of the most anticipated events for any teenager, and both the attendees and their parents go all out to get prepared for that one night. In addition to the dress/suits, shoes, transportation and date, there is also the prom flowers that need to be taken into consideration and even more so, the corsage. Not every boy gives flowers for prom, but every girl loves to receive them. Parents will also give flowers to their daughters for prom, but more often the fathers than the mothers. Prom flowers can be bought via flower delivery, and the element of surprise is sometimes necessary here. For many young ladies, the type of flowers is important, but for others, any flowers will do. Some of the more popular flowers that are used for prom are carnations, roses, orchids, daisies, and lilies. What is used to make the corsage and the bouquet are different, but both are just as beautiful and will give the young lady the delight that was intended in the giving? Corsages are beautiful, they are like ornaments from your prom and many young ladies and girls preserve them by placing them into the pages of a book so they will become dry and remain beautiful. Carnations and roses are two especially popular prom flowers, because of their sturdiness, and the range of colors that they are available in. flowers are expected to last for the entire night, so getting the ones that have a longer lifespan after cutting is very important. In a bid to make a lasting impression and have a fabulous photo op, the flowers should be beautiful and as fresh as they can be as those memories will transcend throughout the generations by way of photographs. If you are concerned about your preference when it comes to flowers, or if the one you like is not available to you at your usual flower shop, then you can get your prom flowers from a florist Toronto and use it to save the day for your daughter. Alternately, you can get your choice as wholesale flowers and create astonishing corsages for your daughter and her friends to wear to prom. Choosing the right color is important, but so too is getting the perfect flowers that will complement the outfit that she is wearing. If you are the mother of a son who wants to give his date flowers, then the same rules apply. You can leave a note to yourself as a reminder and label it “to visit a flower shop near me,” to ensure that you do not forget such an important event. If you are the one attending your prom and you are the one shopping, just remember that whatever the look you choose for prom, there are similar color flowers that will complement your outfit. You have the option of choosing the ones you prefer. For many young ladies, they eagerly anticipate their date’s arrival, just to see the corsage, if he is the one presenting it. Times have changed, it is no longer a requirement for males to present corsages, but many females do. You can buy your prom flowers from flower shops, or if you already have the flowers growing in your garden, then you can try to create a neat little bunched up corsage that will turn heads and encourage compliments. 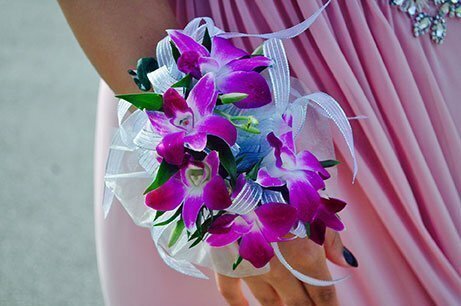 Flowers for prom are so diverse and so captivating, that whatever type you choose will stand out and look beautiful, so even if you choose one of the less popular ones you will still shine with it strapped to your wrist.